Narrated and written by Siha Gnet. Your story is important because only you can decipher and put meaning into these experiences. If you are willing to share your experience, where do you start? Why should you start? We may have an answer or two for you. Are you ready? Now imagine a package that is a cardboard box filled with diamonds. These diamonds are worth millions of dollars yet the question I put in front of you is, what is most important? The cardboard box of this package or the diamonds? Almost everyone will say the diamonds, the contents in the box. Others will say, what a dumb question to ask because it’s a no brainer that diamonds over a cardboard box is obviously more valuable. Now imagine if you were stranded on a cold island in need of a fire and you needed something to spark a fire to survive. All you have is a lighter and this package that contains these valuable diamonds. Although you see the diamonds, the cardboard box is the only object in front of you that can start this fire. You see, the point I am making here is content is what you make it. Consuming content is a subjective experience and value is put on content on a case by case basis. Content has value the minute you can relate to it. 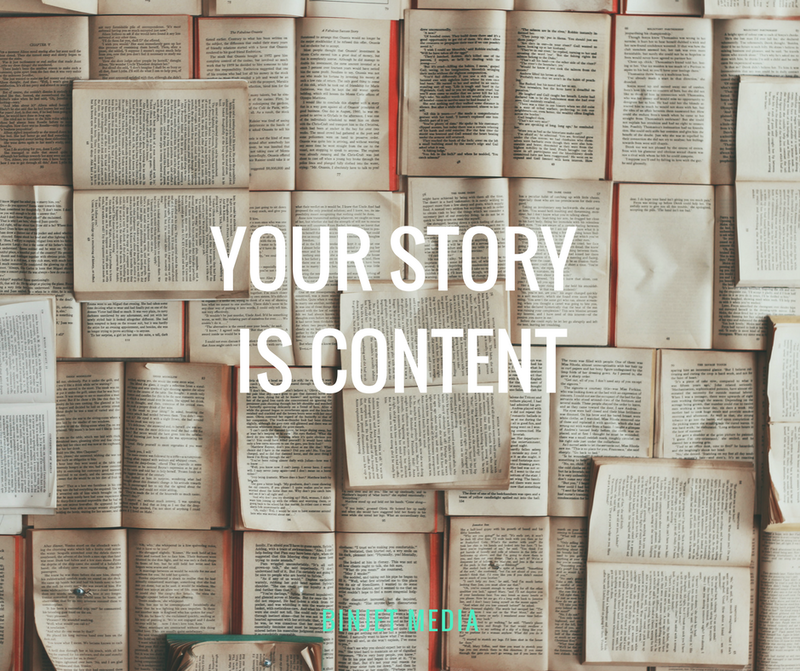 Your story is content. Your brand is content. Your next event is content. If you are struggling to find an audience, like most start up artists and brands, look at it like this. Imagine your story is like a spark potential to be bonfire. You finally spark it enough to catch. The fire spreads depending on how much you feed it and it soon becomes a bonfire for everyone to come and warm up to. These people who come to warm up to your bonfire are complete strangers that have one, two, or many things in common, your story. Your content is the same way. The more you feed it, the more it grows. The more it grows, the stronger it gets and so on. In addition to, something as silly as If you are passionate about the color blue and all you talk about is the color blue, there will be fans and people who will relate with you. Moreover, if you are passionate about sharks flying in a tornado, you might create content around it in forms of writing, blogging, filming, and networking. Your goal may have changed from time to time but one of them is to make a movie series called Sharknado. Your content is waiting to be discovered! Anything is possible as long as you have the fire inside you to maintain what you are passionate about and willing to communicate with this world of consumers. Your audience and market will always find a way to find you because your content, this “fire”, can be burning on a consistent basis keeping everyone warm when you are ready to do it. And consistency is the key to a large fire. If you are looking to share your content in a way that is digestible and impressive to your audience, you start with the technologies you have at hand. Your content is able to communicate with others and it requires a vehicle. The vehicle can be in the form of writing, video, audio, and photo. You have all of those capabilities in your pocket or on your desk right now. Your content is important to that one person or millions in the world looking for it. We understand now that your story is content and people may like it. The next part is, are you willing to share this content with people that will support and challenge you? Are you willing be vulnerable in a world full of opinions in order to bring value into someone’s life? If the answer is yes, then please continue reading. Your story is worth sharing when you are ready to. When you are ready, there are many different ways you can share and communicate but let’s talk about two of them. The first is keeping it short and simple. The second is making it impactful and epic. Both ways require you to be vulnerable but both ways can be completely different in terms of the consumer experience. You can easily get on your phone and go live on social media and create a pre-recorded video and share it with everyone. On the other hand, you can spend more time on creating an experience that requires more planning and production value. Both ways may be memorable to the consumer but both ways require different approaches to producing the content. Regardless of how fancy these two ways may be, the content is what matters. This will determine the kind of content that is published and the method realized to fulfill your goals. Each goal requires time and energy. If you spend thousands of dollars on a production to make it perfect, this may be a project that you are looking to repurpose and squeeze for as much value as possible. This path may be a smart depending on your goals. For example, if your goal is to generate money and turn a profit, you may have to have advertisers or sell products and services supporting your content. If your goal is to connect with other people, you may need to start a blog or video channel. Understanding what you want out of content will determine how much time and energy you put into creating it. You don’t need nice equipment to start building content. To illustrate, If you were a news reporter with nice equipment, you may have the ambition to capture as much as you can with the information you have. Your content is good enough and you share it with all the news outlets to publish on TV and websites. Now imagine another news reporter with low quality equipment was able to go even deeper in the event to capture the details that changed the entire story. Now your content is shifted from your clean and professional looking story to another regardless of the quality of equipment. Content is king at the end of the day. The point we are making here is, your story is content and you have a choice. You have a choice to immerse your audience with an experience. You have a choice to be vulnerable and connect with other people. You have a choice to invest in equipment or services to communicate your story. You have a choice to start communicating.